I had a visitor today, Brian Longden, a gentleman who had once been in the choir at Old St Georges Church. He brought around a few photos for me to copy and share on the blog. Wasn’t that kind? I’ll also add the photos to the relevant posts about the church and churchyard but wanted to get them up now so that regular reader can see them straight away. Above is the third, and final, Old St Georges Church, Cockerhill. 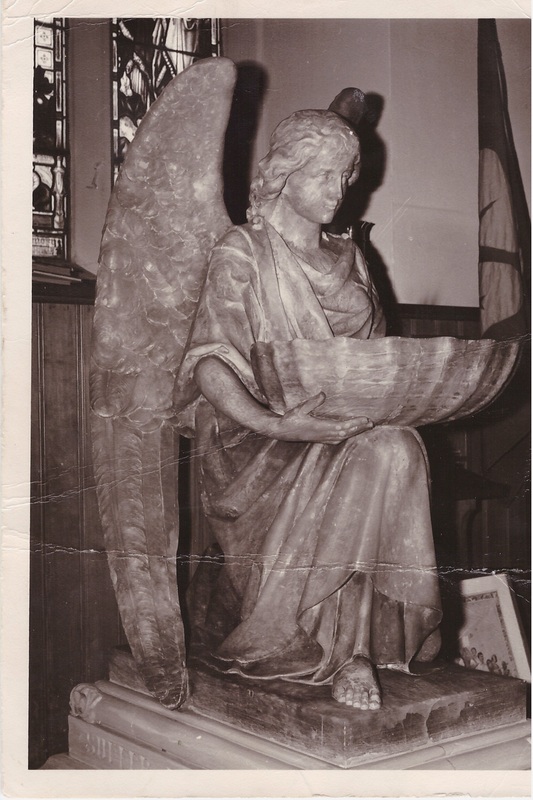 The photo was taken pre 1939 as the churchyard railings are shown and these were taken down and smelted in World War II. I love the street lamp. Cocker Hill still has a number of old street lamps, but none as nice as this. Above is the same church building. I think this photo was taken in the late 1960s just before demolition. The illuminated cross, shining out over Stalybridge was well known at the time. Someone recently commented on facebook that they were glad when the church and the cross were demolished as they interfered with the TV reception locally! This is the interior of the church, it’s very grand isn’t it. The windows must have looked spectacular. 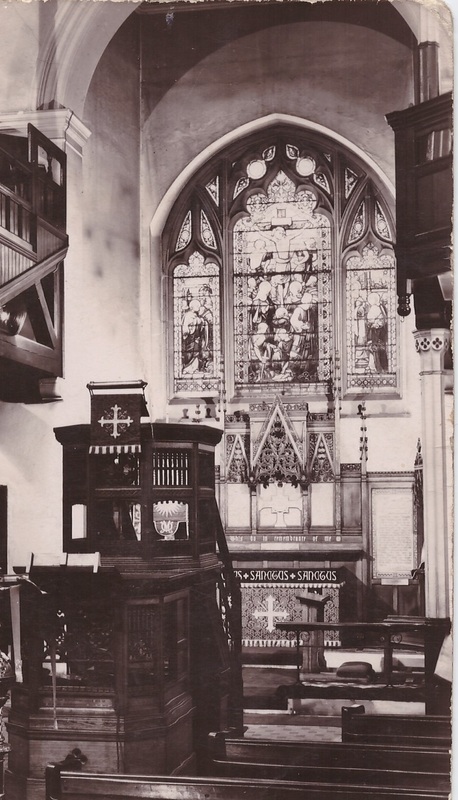 I understand that the choir were either side of the pulpit, male choristers on one side women on the other. 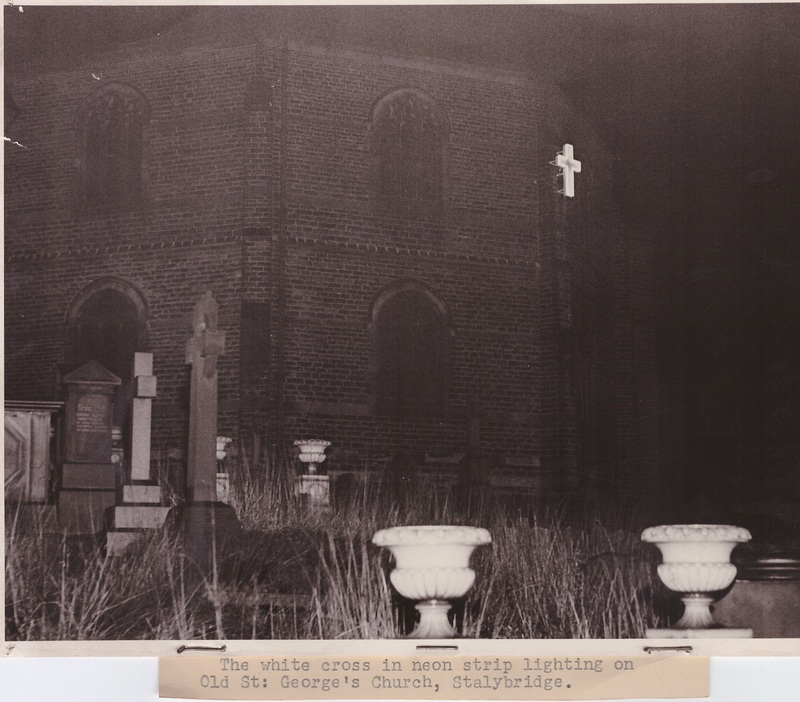 This font has now been moved to New St Georges Church, but is pictured here in its original home at Old St Georges. 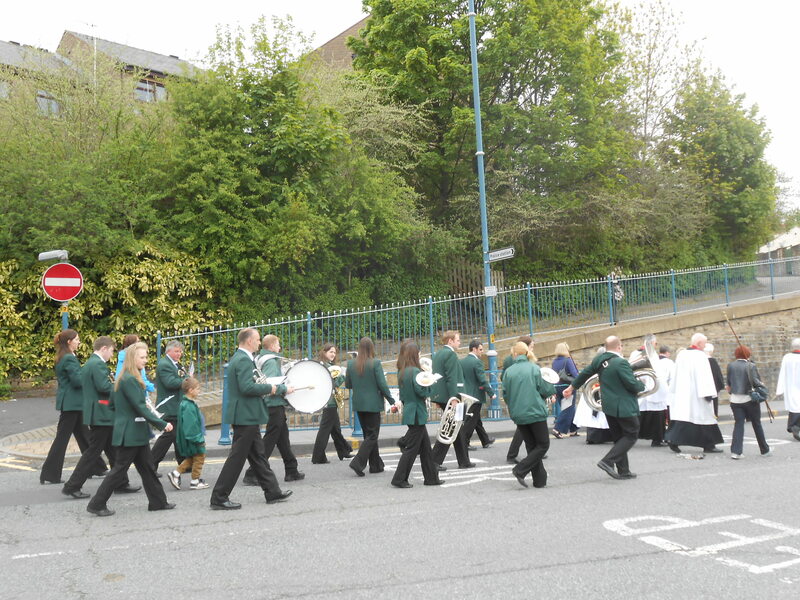 NOTE Photos copied and reproduced by kind permission of Brian Longden. As usual, please read the comments below and add your own if you have any memories of or connections to Old St Georges Church or Cocker Hill in general. I’d love to hear from you. I have grouped together here old photos of the area. 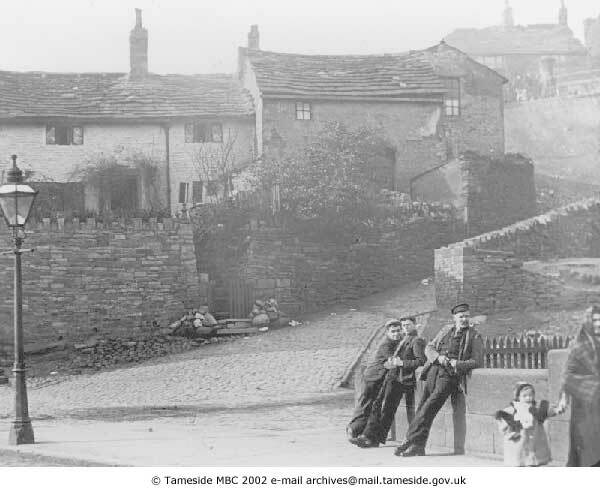 The majority of the old photos below are available to view and buy from The Tameside Image Archive. Above is either the first or second St Georges Church, Cocker Hill. The first church was built in 1776, the second sometime after 1778. 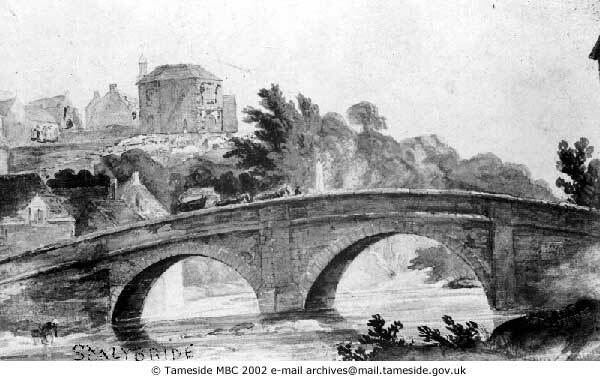 The Bridge in the foreground was built 1707 and replaced in 1824. Which dates the scene as between 1778 and 1824. I suspect the photo is the first Church as a photo I have of the second seems to show a slightly different roof. The second St Georges Church in close up. Above is the second St Georges Church in detail. The above shows the same Church and the surrounding buildings. 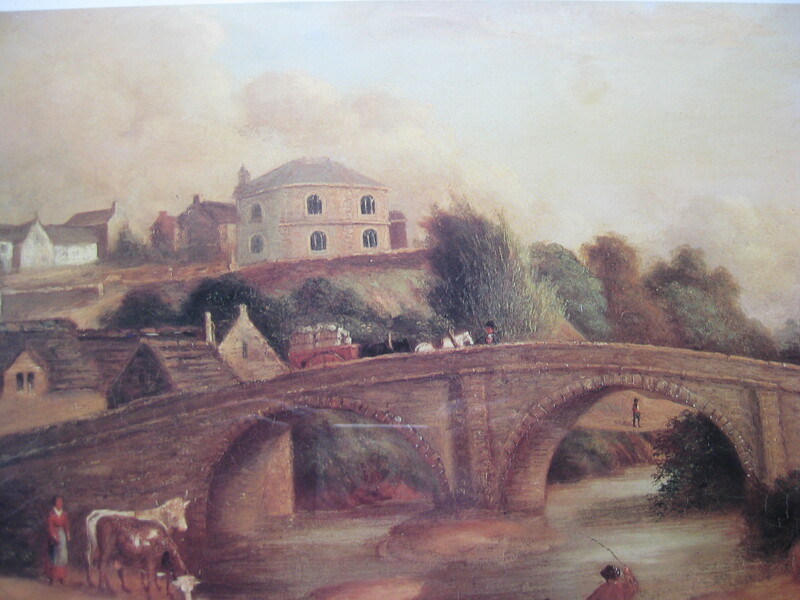 Wakefield Road Baptist Church is on the top left which means that the picture is was taken after 1848 when it was built. 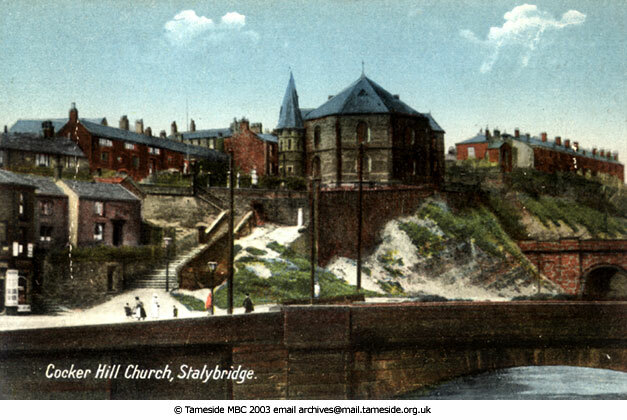 This picture shows the Third St Georges Church, Stalybridge. 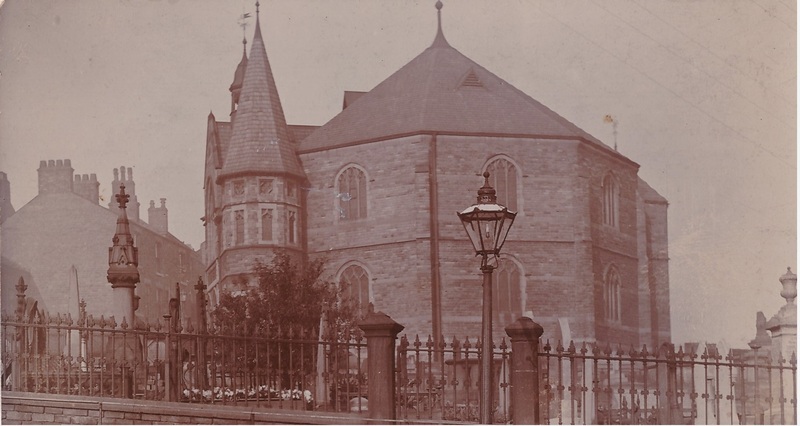 This dates the picture as some time between 1888 and 1968 when the Church was demolished. Also note the viaduct in the background. The picture below shows the demolition of the viaduct. This picture of Cocker Hill caught my attention it is in colour but not a colour photo though. The colours must have been added later as the Weavers Cottages in the middle ground are shown as red brick when they are actually all local stone. 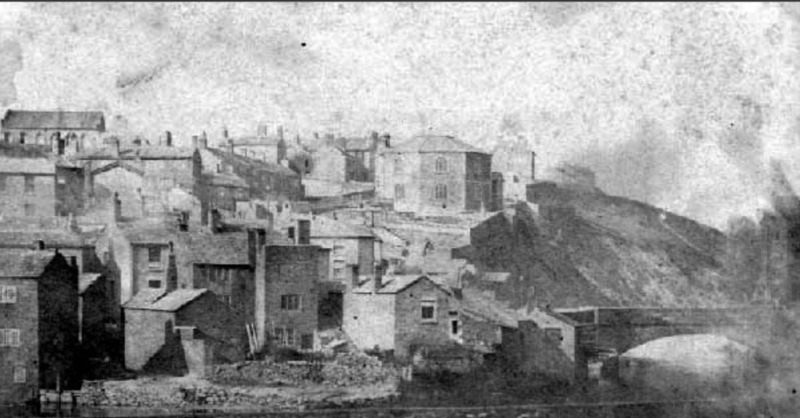 The above shows Bohemia Cottages at the foot of Cocker Hill. The people on the photo interest me; did they know the would be in the picture? I guess they would not have believed that people would still look at the photo today. 25/03/13 – I have found out more about the photo since I put it on here. I was posed and part of a series showing workers of the area. There was no such thing as a quick snapshot when it was taken! The picture above is taken from Stamford Street and shows the Whit Walkers walking down Cocker Hill. 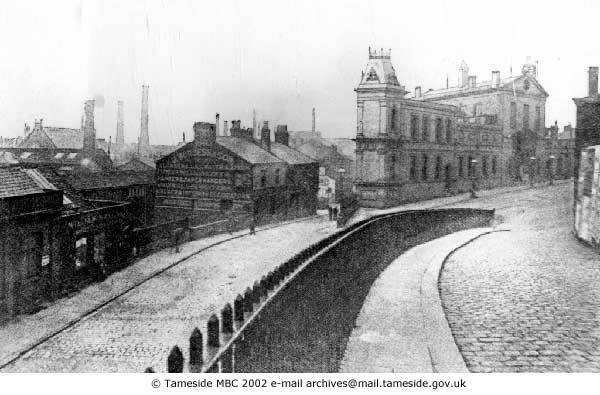 The building on the left is now Thompson and Cook solicitors as you can see on the up to date picture below. The pub in the centre was the Star Inn. In between the two were a set of steps. A friend remembers the steps from her youth “We had to go up these steps when we came out of Stalybridge to get to our house on Hall St. 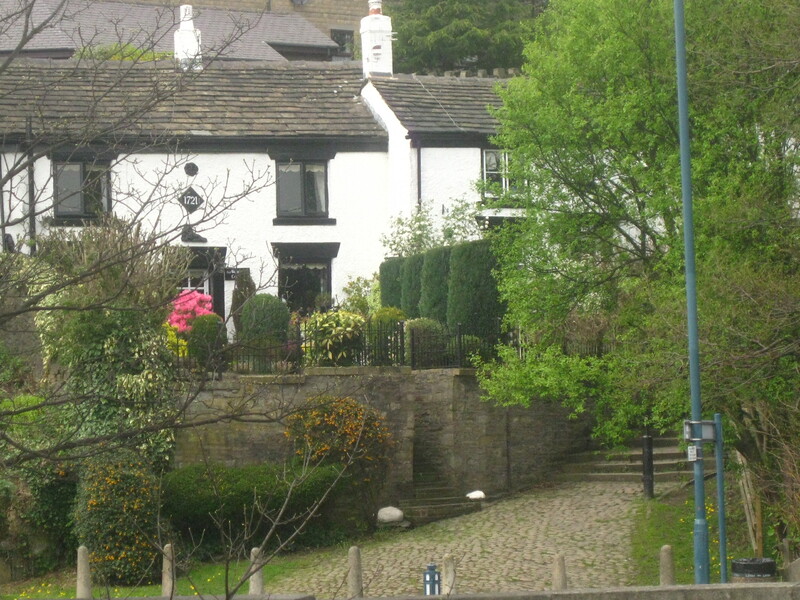 When we were kids they were always known as the Starrin steps” The Star Inn has since been demolished. 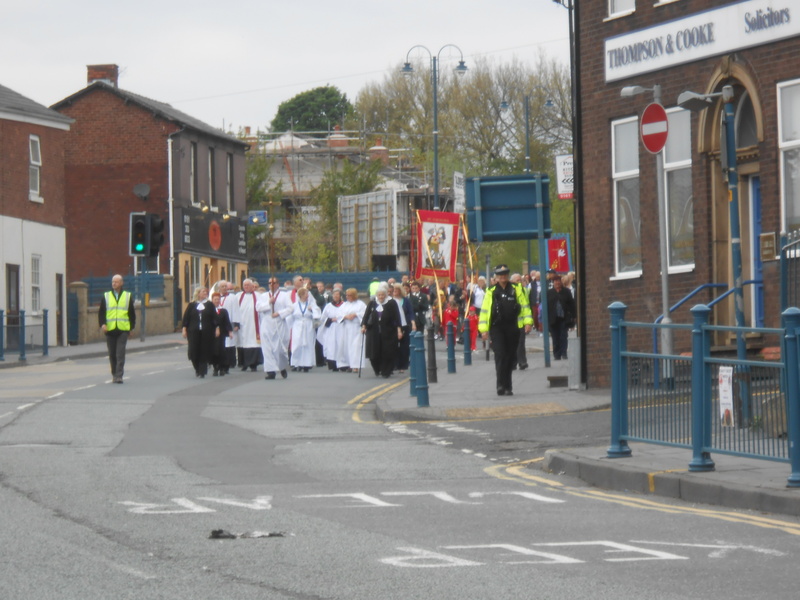 Below are two pictures taken in 2013, the whit walkers in this case are coming down Stamford Street rather that Cocker Hill and are from New St Georges Church. 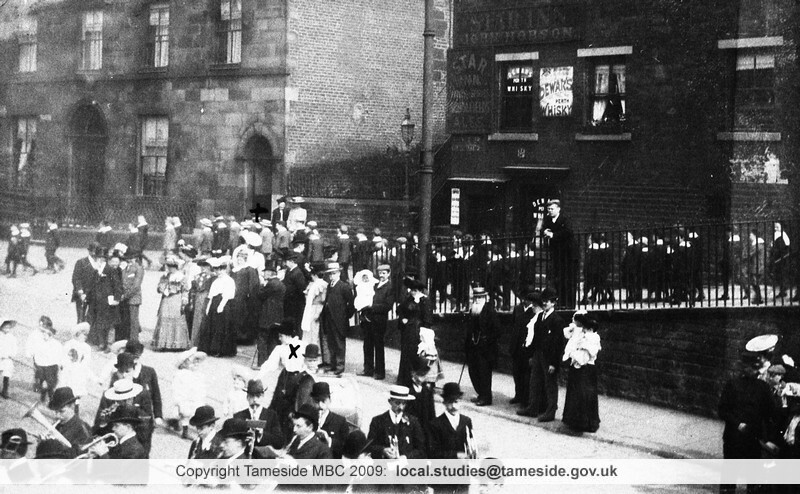 The picture above was taken looking down Cocker Hill towards Stalybridge Town Hall. 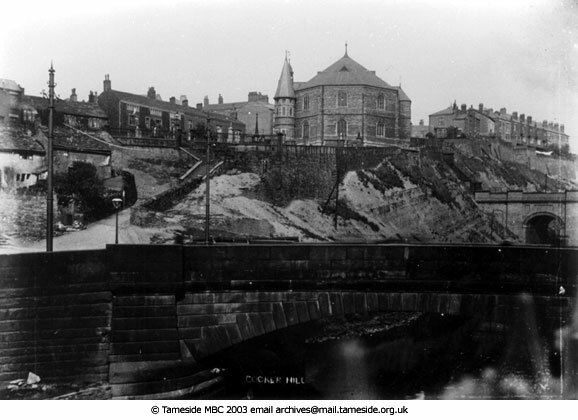 The cobbles on Cocker Hill are still there but the majority of the Town Hall has now been demolished.